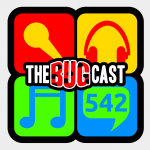 This week on The Bugcast: an update on the pool marathon and our November projects, a rant about misuse of the emergency services, and 8 phenomenal tracks of Creative Commons music! The next show will be episode 543, which will be pre-recorded and premiered in the chatroom on Friday 14 December 2018 at 21:30-ish UK time (GMT/UTC). The next live show will be episode 544 – our Christmas show – which will be streamed live in the chatroom on Friday 21 December 2018 at 21:30-ish UK time (GMT/UTC).